I have been reading the new Beldrob'baen World Setting page, and it seems that their ancestors survived the demonic invasion holing themselves in their stronghold in their montanious homeland, Phariasta. That means that the Vanir, the people from Phariasta and the ancestors of the Jie'yen (from Nüwa) all managed to survive in isolated, easily fortified places in the surface. Once the demons had eaten all the fae on the surface, there wasn't a great difference between the Underworld and the surface, both were devoid of mana, both were equally inhabitable to nether demons...so, why didn't the elves from Phariasta and Nüwa try to expand to the surface from their strongholds (like the Vanir did), instead of migrating to the Underworld? Yes, the chance of meeting some surviving demonically possesed elf could be greater on the surface, but the ancestors of the Balvhakara held in Phariasta for 300 years, and the ancestors of the Jie'yen stayed at Nüwa for 400 years...at that point there should be less demons roaming the surface that at the beginning of the Moonless Age (demonically possessed creatures apparently can't breed on their own, or they would still exist in great numbers in the surface). The only reason I can find to explain their migration to Nuqrah would be that at that point they already kept trade and diplomatic relations with the Illhar'do, and when a new demonic outbreak started (maybe they somebody started to play with nether gates again, or they found a sealing stone full of demons, or they unearthed an old demon...etc.) they fled to their allies' city. Still, even if the fled to Nuqrah, they could have founded a colony in some place in the surface, maybe even right above Nuqrah soon afterwards. Those were people who were used to live on the surface (where food and resources are plentiful), they were numerous enough to make a decent-sized mana pool, and had to start from zero anyways no matter where they relocated. Also if mana works like either a liquid or a gas , it will disperse and flow away from places of higher altitude to places of lower altitude . This will mean that there will be less mana at higher altitudes (like there's less air at the top of Everest) , and thus Phariasta , even if demon free , will be an unattractive place to live , as mana pools will not form and remain reliably . However the lowest possible areas will have much better mana pools , and if they are like mines in our world , the mana may be trapped down there for even longer (mines in the real world have poor ventilation , so moisture from people breathing and CO2 , can build up to dangerous levels while underground) . Even Vanheimir is located in a valley , which may stop the mana from flowing away as easily too. While a valid possibility, I don't believe that mana works like that. At the end of the day it's not been really defined in canon but it seems that loose mana would diffuse independently of the physical world around it. I understand that mana is not affected by non mana matter, so being diffused and pushed downward according to fluid diffusion would not apply to it. Like I said though, I'm not sure and it really isn't all that important to topic at hand. Personally I think that the move was a socially motivated one. 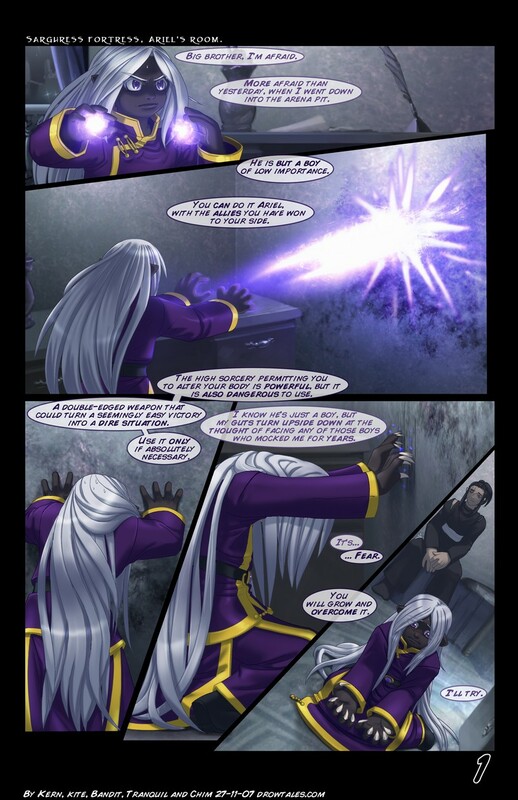 Drow like to be around other drow, the more mana is around the better they do, if I'm not misreading the comic. I think it possible they decided to see what all the fuss was about down below and as more and more made movements and saw the great things being done down under, and began to make a gradual move punctuated with the leaders eventually going "Right then, more bits and riches downstairs. Pack up lads, ada await!" After all, to this day these later settlers pride themselves on the power of their own designs. If the move to the underdark was a clumsy and foolish retreat would they really be prideful of their farce to stay on the surface? Personally, I believe not. No. Also its falling arcing motion shows that it is effected by gravity . Also I think it was stated that people on the surface live in holes in an attempt to trap the mana with them . Dalvyserran wrote: Would you really want to try and found a colony in a wasteland? There is your answer: resources. The beldrobbaen ancestors left with Sharess, and those that left later are the balvhakara ancestors. They could have built a farming town right above Nuqrah and make good money shipping food to the city (they were used to grow their own food on surface); they would have the best from both worlds: The food from the surface and the money and tech from Nuqrah. True, but they obviously were distinct groups long before arriving to Nuqrah and still are...why choose some other date than their arrival to Nuqrah as the official beginning of the group. There are some other posibilities (like each of them being the fussion of several smaller clans that arrived as independent groups to Nuqrah and later combined into one), but until we read some evidence pointing to that, the date of arrival and founding of the clans are likely to not be very far from each other). Alto wrote: Personally I think that the move was a socially motivated one. Drow like to be around other drow, the more mana is around the better they do, if I'm not misreading the comic. I think it possible they decided to see what all the fuss was about down below and as more and more made movements and saw the great things being done down under, and began to make a gradual move punctuated with the leaders eventually going "Right then, more bits and riches downstairs. Pack up lads, ada await!" But the people from Phariasta and Nüwa were dokkalfar, not drow, and the drow had exterminated their dark elf ancestors...I don't think they would want to go join the drow without a very good reason. Actually we know that the projectile formed FROM mana is affected by gravity, the energy that IS mana could be similar to heat energy. Invisible and unaffected by gravity, generated by most living things (in this case fae) as a byproduct of a number of factors like natural biochemical reactions in cells and proximity to others. Khora2150 wrote: the energy that IS mana could be similar to heat energy. Actually air loses heat energy as it does work against gravity . This is why higher altitudes are cooler then lower ones , and also why there is less atmospheric pressure the higher one goes . This is called an adiabatic process . So if it is like heat , it will be affected by gravity . True . However people refer to their shiny stuff as mana . Which makes this nomenclature confusing if it is not what they are talking about . Khora2150 wrote: The energy would be dispersed eventually regardless of location the further away from the source the energy drifts. This is a very loose comparison mind you, but it seems to fit better than gas or liquid. This still leaves us the question of why the mist (which is mana) , congregates in low areas (ie; the mist sea , which is located in a deep crater), if we accept your explanation . It also gives no real reason as to why they should have preferred , deep underground areas to areas on the side of mountains , as if it was simply something like electromagnetic radiation , the concentration of mana in their vicinity should have been similar provided they had the requisite people , and apparently both areas were fairly demon free . The heat (I have no idea if you mean electromagnetic radiation produced by objects with heat , or the heat of jiggling particles) explanation would not predict different concentrations of mana at these different locations , only the abundance of Fae life would do so . MEK1724 wrote: This still leaves us the question of why the mist (which is mana) , congregates in low areas (ie; the mist sea , which is located in a deep crater), if we accept your explanation . It also gives no real reason as to why they should have preferred , deep underground areas to areas on the side of mountains , as if it was simply something like electromagnetic radiation , the concentration of mana in their vicinity should have been similar provided they had the requisite people , and apparently both areas were fairly demon free . I can't find the posts, but the DTs team has confirmed that the Mists from the Nidavellir AREN'T mana. They are some sort of chemical vapors or dust. It's true that they make the mana disperse more slowly (i think that caves' stone walls keep the mana from dispersing too fast too), but even taking that into account, the Vanir, the Tei'kailath, the people from Ys, the flying dragons from the floating island and the people from Phariasta and Nüwa themselves do or did fine in their surface settlements...you can have a decent mana pool while living in a surface settlement. Doom Chinchilla wrote: I can't find the posts. I'd suggest you find the posts if you want to say what those posts said . And you're saying that something which is described as , "looking like mist" isn't what is in the mist sea ? Doom Chinchilla wrote: So...is it confirmed? The Mists of the Nidavellir are something more than Ashes or than ordinary mists? If they can keep alive a giant mana tree...does that mean that they bear mana? Are the Mists maybe the renmant of the auras of dead drows and elves? Can the drows and elves use the mana from the Mists to feed their auras and/or their machines? Can demons feed on the mists? Nothing like that. Kern said in a livestream that it's pretty much an ordinary mist. What the mist does however is that it mixes with mana. It keeps mana underground, else the mana would just disperse into the atmosphere and living in the Underworld would be pretty much the same as living on the surface. Also it wouldn't affect living in the cities that have a stable manapool such as Chel. Surface city like Tei'kaliaths Shifaye'sindil has a manapool too. If that tree would be destroyed, living on the surface would be easier when compared to living Underground. So it seems that Kern said in a livestream that the mists aren't mana. Doom Chinchilla wrote: So it seems that Kern said in a livestream that the mists aren't mana. Not technically an actual source . Also it makes other things I can link to confusing . Mana can be trapped or stemmed via organic material and inorganic material. The Tei'kaliaths were advised to stop cutting the trees down around the immediate vicinity of their colony since the mana would have more room to disperse. Mana cannot phase through matter. If it hits something, it hits something. It won't go through walls for example. Secondly, mana is retained in Chel and the other Underworld cities by a range of factors: the mist sea, which somehow prevents mana deprivation. The TK airship seemed to recover well when dipping into the mist sea, and mana fatigue was lower. Isolation, Chel is an enclosed space underground surrounded by rock with only a few tunnels leading out. And lastly, Chel at least is protected by mana resistant stone which can help retain the mana.